Here at Realvolve, we send a lot of emails. 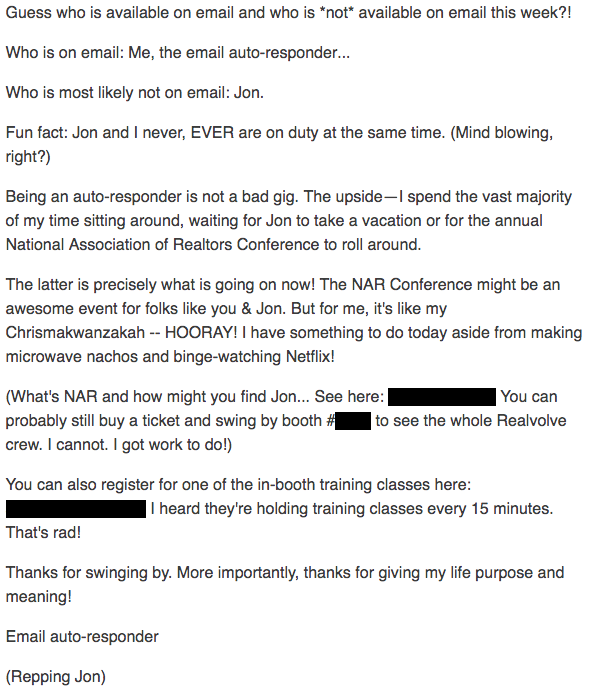 And I always get excited during the holiday season, spring break, or yearly holidays because this is when I start to see a lot of great (and not so great) out-of-office messages from real estate agents. If you're a 24/7 agent, you don't have a lot of time to get creative. But if you plan ahead, you can craft some awesome messages that will leave a lasting impression on your contacts. 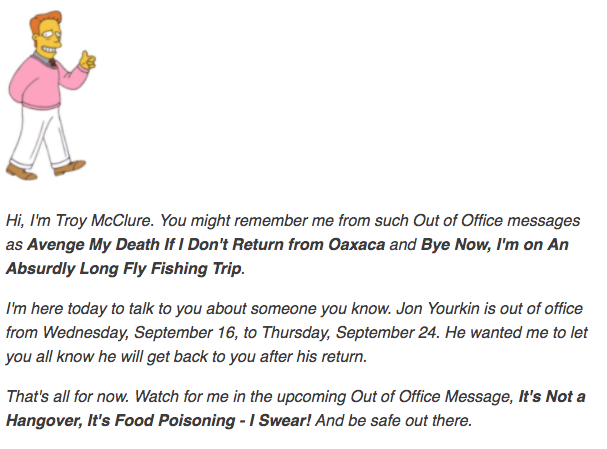 I have a lot of out-of-office messages in my vault, and I'd like to share a few of my favorites with you. 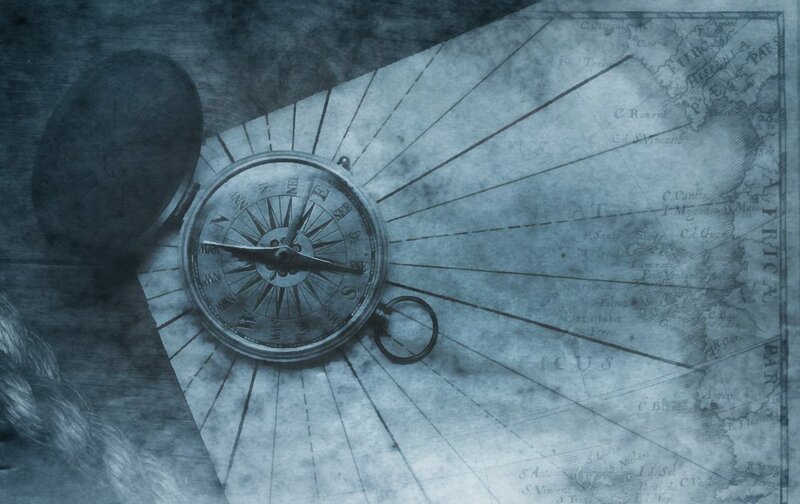 Some are my personal go-to messages, some were designed for colleagues, and some I simply created in a pinch. Check out these 5 emails, and use these ideas to create your own out-of-office messages for your next vacation or holiday getaway! Are you familiar with the film Back to the Future? If not, allow me to fill you in: it centers around time travel, a DeLorean, and a mad scientist (saying any more will spoil the plotline). It's one of my favorite films, so I crafted this out-of-office message to inform people of my whereabouts in a way that would make them smile. Reference your own favorite flick to create a clever message. Bonus points if you include a GIF! 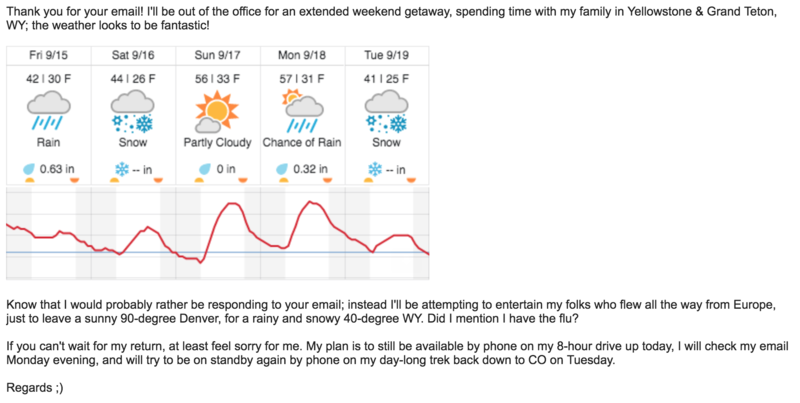 When one of my colleagues fell ill prior to her vacation and learned of the sudden change of weather at her destination, we thought this out-of-office message would be perfect! Not only did it make her customers chuckle, but it also generated a certain amount of empathy (which is often key to building meaningful relationships). About three years ago, I received a very powerful reply to one of my generic out-of-office messages: "You're in marketing, and for someone in marketing...your response is terrible." So I stopped messing around! In fact, I turned my auto-responses into a running series of commentary from Troy McClure, the cheesy TV presenter character on The Simpsons. 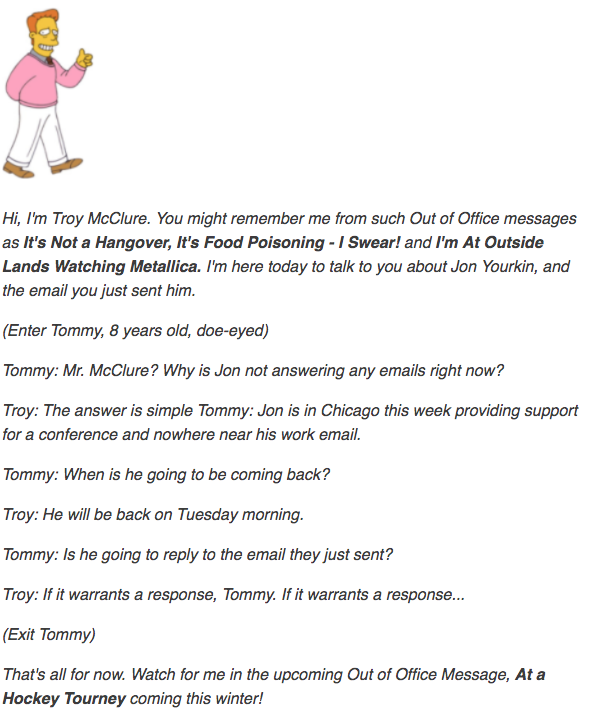 Each time McClure makes an appearance in these out-of-office messages, he speaks on my behalf and alludes to the previous auto-responses in which he starred. As with the Back To The Future example, don't be afraid to use a pop-culture reference that your potential clients would recognize. Instead of bemoaning your absence, they'll have something fun and familiar to laugh at. The second email in the series. In this clever out-of-office message, written by one of our real estate agent customers, she used cheeky wit to make it clear that she would not be checking email while on vacation. She also incorporated the smart technique of holding the sender accountable by asking them to send their email again after her return. This allowed her to truly vacate her work while she was away. And that's very hard to do in real estate (if that's something you struggle with, check out our blog post on why you must make time for rejuvenation). 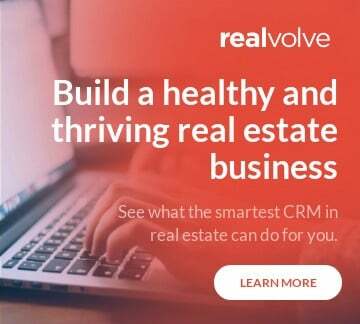 This is one of my favorite concepts: generating inbound leads for your real estate business while you're out of the office. The following out-of-office message uses the age-old email marketing technique of Attention-Interest-Desire-Action by captivating your reader's attention all the way to the call-to-action. I like this approach because it gives the reader options to stay connected but also provides links to additional information. In the example below, I offer them the opportunity to meet face-to-face or register for a training class. You can use this template to link to your social events, open houses, or even current listings. Over To You: What’s Your Favorite Out-Of-Office Message? If you’re up for sharing, we’d love to see your own go-to messages. What can we learn from your experience? Share your out-of-office messages below!